The most popular names put forward for the new Bakerloo line stations have been revealed - with Mandela Way among the favourites. Transport for London has now published the findings of its two-month-long consultation on the extension from Elephant and Castle to Lewisham. 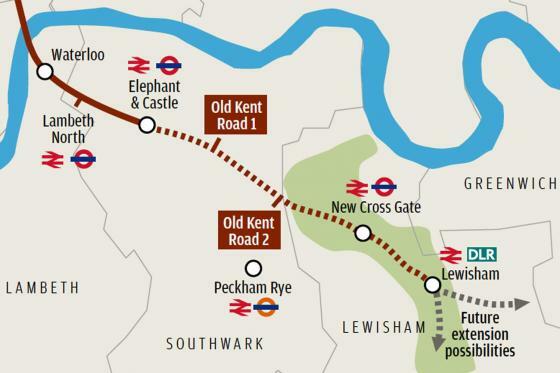 There are two new proposed stations, both located on the Old Kent Road, as well as Bakerloo line stops at current stations New Cross Gate and Lewisham. The precise locations of the new stations have not yet been decided. Burgess Park was the most popular name for the first station, in honour of the nearby 56-acre park. The second most popular option was to name the station after Nelson Mandela, as it will be located near the existing Mandela Way. Another suggestion was Thomas A Becket after the historic pub, so-called because Sir Thomas Becket stayed in the area in the 12th century. The pub – now a Rock Island restaurant - is also famous as the place where boxer Henry Cooper trained. Old Kent Road North, Walworth East and Albany Road and among the other names put forward by respondents for the station, which will either be located opposite the B&Q store or on Mandela Way. The second station, further south on Old Kent Road, was given Peckham North, Peckham Park and Old Kent Road South as suggested names. The most popular was Asylum Road, although one respondent specifically opposed adopting the name of the long road which leads to Queen’s Road in Peckham. A TfL spokesman said they would consider the suggested names but admitted the final decision has to be "logical". "It has to be logical so people can picture in their mind where the station is," he added. The final decision on names will not be made for some time, with agreeing on the locations of stations and shafts the priority.